I am creating this account for my grandson Jackson Lyman (Jax). Jax's best friend, his dog, Dallas was hit by an SUV last evening, Sunday, 26. Jackson rescued Dallas a year ago from a shelter and they have become inseperable. The veterinarian says he will recover but he will need surgery, medicine and professional care. The biggest life threatening injury was loss of blood which they were able to get under control with IV's and oxygen. Now that the immediate danger is over they will have to deal with multiple breaks on the 'ankles' of both back legs. He will need two surgeries and pins. The toughest thing will be the ligament damage for mobility and at least 2 months of recovery time. The road ahead for Dallas not only looks painful but very costly. The care will cost somewhere in the $10,000 range at this time. It would mean so much to Jackson and Dallas if you would like to contribute. I will keep you updated on Dallas's progress. Thank you so much for thinking of Jax and Dallas. Jackson and family can't thank you enough for all of your prayers and donations. We are very grateful for so much love and support. Because of the extent of Dallas's injuries, the cost has continued to climb and is now expected to be between $16,000-$20,000 so we raised the amount we asked for to cover the additional costs to take some of the worry from Jax. Thank you! Jackson, Dallas, and their family can't begin to express how grateful they are for the love encouragement that has poured in since the accident. Because of all of you, Dallas is receiving the care he needs to heal completely. From the initial treatment right after the accident to round the clock care in the days that followed, through his surgery and now in the recovery period, your support has made it all possible. Because of the extent of Dallas's injuries, the cost is now expected to be in the $16,000-$20,000 range. When the decision was made to save Dallas, no one dreamed the cost would climb so high, but the awesome news is that he is healing and getting better every day. There was concern that one of his legs had too much damage, but it has begun to turn pink this week - a very good sign that healing has begun there also! Thank you all from the bottom of our hearts. Dallas is out of surgery and awake! AND he gets to go home TONIGHT! The details: It went really well on the right side repairing ligaments and setting bones with pins. They were able to close the wound 95% with the flesh and skin that he has left. The rest should heal, but they might need to do skin grafts later. On the left side, they reset the bones and placed a splint and cast on them. They might re-evaluate it later. The immediate concern on this side is that he lost so much flesh and skin that there isn't much to work with. It will need skin grafts later. There is still concern of getting an infection because the wounds are still open so he will be on antibiotics for 6-8 more weeks and he will need to go in every 3 days for a while for bandage changes. On a really good note, with time, the doctor seems to think he should be able to run, jump, and play again! Dallas went in for his surgeries at 8am today. Jackson asks for prayers that it goes smoothly. We aren't sure if they started right away or how long it will take, but will update as soon as we hear anything. As usual, pictures were posted on Candi's facebook page before he went in if you want to peek. Dallas saw the surgeon yesterday and the wounds look good and things have healed enough for the surgeries! His surgeries are scheduled for Thursday so please continue to pray for him as this will not be an easy fix. As said before, there are multiple breaks on both back "ankles." Along with that, the ligaments on his right side are 90% compromised so they will need to put in synthetic ones. His left paw has been swollen and had more skin and flesh affected. There are two fractures that will have metal fixtures. Even though they will realign it, he will still need a splint for 8-10 weeks after the surgery for further support. He will be there for 24-48 hours. We will update as we get more information. Once again, we thank you for all your support! We can tell Dallas is happy to be home because of his wagging tail and because his shedding has become sooooo much less than at the animal hospital. Jackson, Dallas, and our family are overwhelmed and humbled by the outpouring of love and support we are seeing here. We know it is going to be a long road to recovery, but you have warmed our hearts with your encouragement. As medical costs escalated we were so concerned but knew that saving Dallas was not even a question. Surgery will be scheduled as soon as there is no danger of infection. We will keep all of you updated onhis progress. May God bless each of you for your compassion. BIG DAY for us all! WCCO'Reg CHAPMAN came to interview Jax about Dallas - will be on in the 6pm news tonight on Channel 4 AND he got to come home!!!!!! He still has a lot of healing to do, but since he can eat go to the bathroom on his own now, he can heal at home. ❤️ We need to bring him in every day to check his vitals, flushn his wounds and change his bandage. If everything heals well, without infection, he can have his surgeries! Keep praying for his recovery please. He's got a long road ahead of him still. Thank you all! Feeling Blessed! Oh my Gosh! We cannot thank you enough for all of your generosity! Since Jackson's Grandma made this account for him we are unable to respond to you, but will soon. Your stories are heartwarming! We can't imagine what it would be like to lose a pet, and thanks to so many of you we hope we won't find out anytime soon! One thing Jackson wants to do in the future is to make sure others get help if they find themselves in this situation in the future so know it will be paid forward! The costs for the surgeries were not included in here yet, so the bills may very well get up to 15,000 so every dollar counts! THANK YOU!!! So thankful that Dallas was able to come home after his accident. His surgeries are scheduled for tomorrow. I hope it goes smoothly. Thank you to everyone that donated and prayed for Dallas. It was very hard to hear the stories about other peoples pets and losses. Grateful Dallas is still with us. Day 2 of Dallas being home and he is having trouble putting weight on his back left leg even with the bandage. He has some swelling in his paw so he might spend a little extra time at the animal hospital today instead of just a bandage change We hope to have him back home over night though. Will keep you updated. As a furry animal lover, I am so saddened to hear this news. I am praying for Dallas. 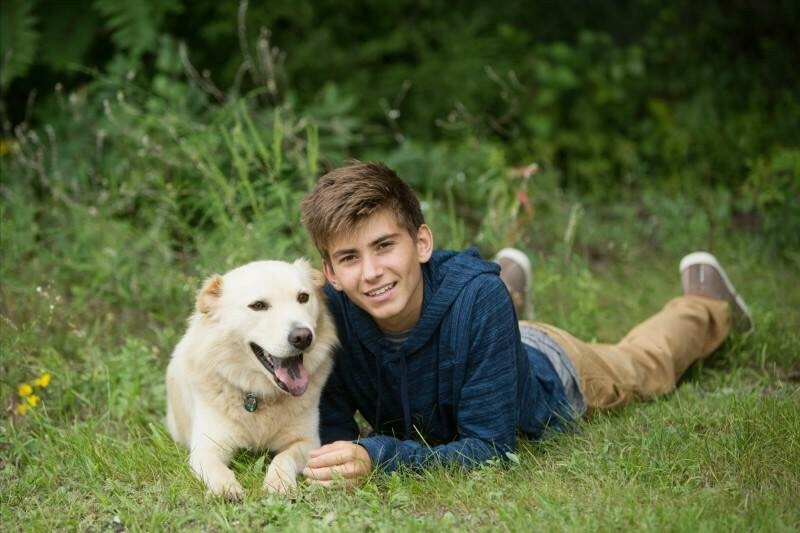 Jackson you are an incredible young man to adopt a rescue dog and undertake the responsibility it takes to care for an animal. Hats off to you by showing your determination to give Dallas unconditional love and a life long friendship. There is not better kind, than the one between a dog and a human. Many good thoughts to you and Dallas- Wishing for a full speedy recovery. Sooooo... Dallas is has a lot more energy now! With the boys back at school, he follows me everywhere and literally makes sure he is touching me!!! Super sweet but kind of sad. It's hard because he is not supposed to be up walking unsupported so I try to stay in one spot for as long as possible. I even have to sling him and bring him with me to the bathroom or he will get up and come wait by the door!!! Poor guy is tired of laying around Well, today he gets his bandages changed by the surgeon so we will have more information on his prognosis... so far they have said one of his legs is healing really well and probably feels so much better for him. However, they are still pretty concerned about the leg that had so much tissue damage. Fingers crossed the surgeon has good news!!!!! Dallas went in for his surgeries this morning. We are impatiently waiting to hear how they went. Praying that everything goes smoothly and he is in recovery mode soon! Praying for his team at the vets hospital/clinic and for a speedy recovery. It makes me so happy the amount that was raised so far for Dallas, there is awesome people out there! I continue praying and sending positive healing thoughts Dallas's way. Thank you for the update praying for Dallas, his human family and the team caring for him at the vets clinic. Thank you for the updates. We hope and pray Dallas continues to heal. Big steps for Dallas... his catheter came out which is a huge step toward coming home! A little steadier on his feet and we can have him home with us to heal and bringing him in for bandage changes. The big trick is being able to get him out to go to the bathroom and not getting ANYTHING on his bandages. We still have to let everything heal and keep praying He won't get an infection before he can have surgery on the broken bones, ligaments, and tissue, but would be so nice to give him love 24/7!!! Dallas looked great today! He walked in the room (with support for his back legs), he tried to get up, and he even barked and wagged his tail!!! That's the boy we know It was the hardest leaving him tonight though because he turned to try and get to Jax. They had Jax lead him to his new kennel which is a bigger space with glass instead of a cage. The boys had church tonight but will be going back to visit one more time after because it is close by. We gave earlier and left the HSO article in our kitchen. While babysitting a friend's 10-year-old, she saw the article and gave me her allowance to pass on to Jackson and Dallas. It's wonderful to hear great stories of things done right! Not enough news published that show the bright side of life. Good for you and God Bless! Happy to hear that you didn't give up and even happier to see that you've almost reached your goal. Animals lovers unite!